Frankentake I was a minor hack on an otherwise commercially-produced product. It wasn't even an original hack. Just a variation on a theme discovered by someone else in the community. In June of 2006, the Chrysler LX platform, which at the time encompassed the Dodge Magnum, the Dodge Charger and the Chrysler 300, was still fairly young. DaimlerChrysler was infamous for the near-total lack of aftermarket support for vehicle modifications. This included all aspects of the vehicle software, which it considered proprietary. The result: The sort of tuning and customization options available to most vehicles on the market was completely absent for any enthusiast owner on this platform. By mid-2006 very little had been accomplished with respect to cracking the platform's PCM or TCM (Powertrain Control Module and Transmission Control Module, respectively). Further, the air intake was not based on mass-airflow, but speed-density, which made it even tougher to play around with. What was supposed to be a simple, cheap, entry-level way to make some extra power was instead a picture puzzle where the vehicle's manufacturer was actively hiding the pieces ... from its most enthusiastic customers. 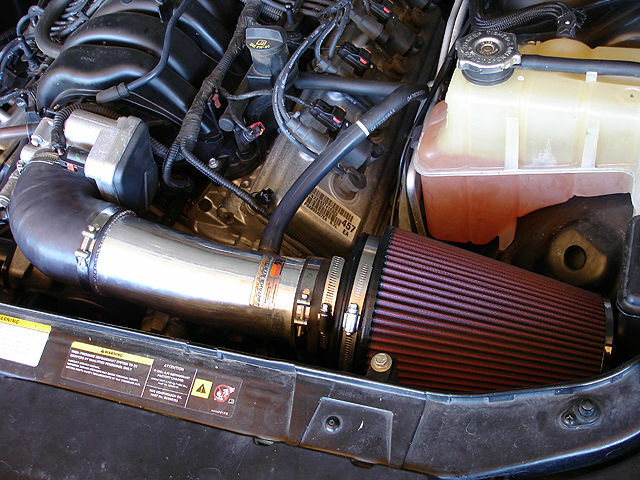 Earlier in the year, through experimentation and no small amount of dynamometer testing, it was discovered that simply putting on a larger-capacity filter onto a short-ram-style aftermarket intake could provide measurable, repeatable power gains. Gains that were not soaked up by the vehicle's adaptive learning software. Since I happened to have the same intake as the discovery was made upon, I took it upon myself to experiment a bit more with the same gear. The result was named Frankentake I, and consisted of a K&N Typhoon short ram intake whose tube had been cut down, and whose filter had been replaced by a massive 6" x 9" S&B Filters unit whose flow capacity was in theory much more than the motor required. In practice we found it wasn't too big at all. The motor thrived on the extra air. Unfortunately, when making my own copy I lacked one thing: the ability to re-machine the heat shield to fit around the now-gigantic filter. I was, however, uniquely aware of the recently discovered and not-yet-publicized lower baffle mod that gave the filter gobs of ambient air, where it would otherwise be languishing in a sitz bath of heat. 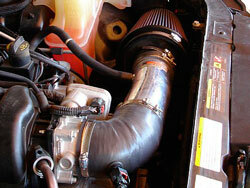 I also was able to find a way to safely dip the entire intake assembly down into this pocket of ambient air. Eventually, a number of air temperature tests proved that, arguably, the heat shield could be done without. Frankentake I lasted only a few months. My work with an intake manufacturer who was developing a prototype intake unit for the LX platform - which would eventually fail - led directly to the creation of the next hacked experiment: Frankentake II.